This book was originally published in 2011 and has been reprinted several times, the most recent in 2016. I guess it must have been quite a good seller, and it's not surprising because the content is great. 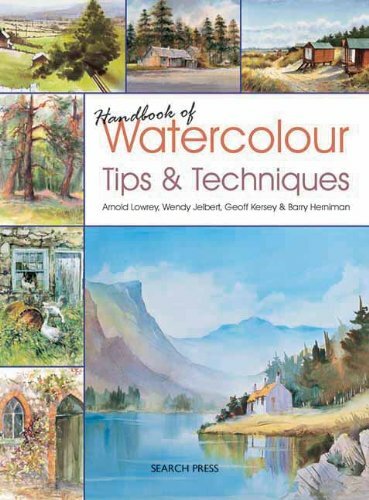 Collected within this 376-page paperback book are 20 tutorials from 4 artists, namely Arnold Lowrey, Wendy Jelbert, Geoff Kersey and Barry Herniman. The content is grouped according to each artist, and in a way, it feels like getting four books for the price of one. Each artist will talk about different types of materials, art concepts, demonstrate techniques and go into the step-by-step tutorials. There are lots of information to absorb and it's a very insightful book. The example paintings are all excellent, beautiful. Subject matter is mostly landscapes, towns, buildings and harbours. So there are some urban landscapes as well. Strange thing is, there's another book that's similar in presentation that focuses on landscapes called Handbook of Watercolour Landscapes Tips & Techniques. If you can't get enough of this book, you can get the other book too. This book is suitable for intermediate artists and for beginners who already have a good understanding of basic watercolour painting. You can use the tutorials to improve your techniques and learn more about how these masters approach a painting from start to end. I highly recommend this to those who want to learn and improve their watercolour techniques.